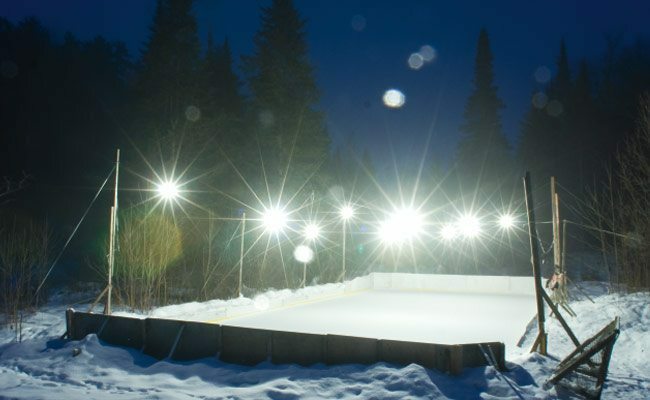 At night, the rink is illuminated by old-fashioned outdoor lights that originally came from Paul Mason’s father’s rink. I had heard so much about Paul Mason’s backyard rink that in the tradition of participatory journalism, I invited myself to his house for his traditional Monday night game and a beer afterwards. “You’re embedded now,” he told me cheerfully after an excellent pre-game meal of fish and potatoes with his family. I look out at it through the flurries of snow falling fine as moon dust into the Chelsea Creek valley that surrounds his home. The rink is 32 feet by 85 feet and sports half-size boards, a centre-ice line made with drops of red paint, and strings of “heritage” outdoor lighting that hang over the ice (they originally came from his dad’s rink). There is even a clubhouse nearby, tucked inside his garage and decorated with posters of Johnny Bower and Ed Belfour. With only one goalie, we play on the principle of “half-court” in basketball — after a turnover, the team with possession takes the puck out over centre and returns to attack. It’s a fast game: three on three and not a lot of space, a game of sprints and short-radius moves. You play as though you’re dodging a meteor shower. The only small hitch is the hockey shorts I picked off the shelf — they have no suspenders, and I have to yank them up now and then.